True to their word, "book doctors" Arielle Eckstut and David Henry Sterry provided local writers with chapter and verse about how to hone their book proposals during an appearance in Westport last week. 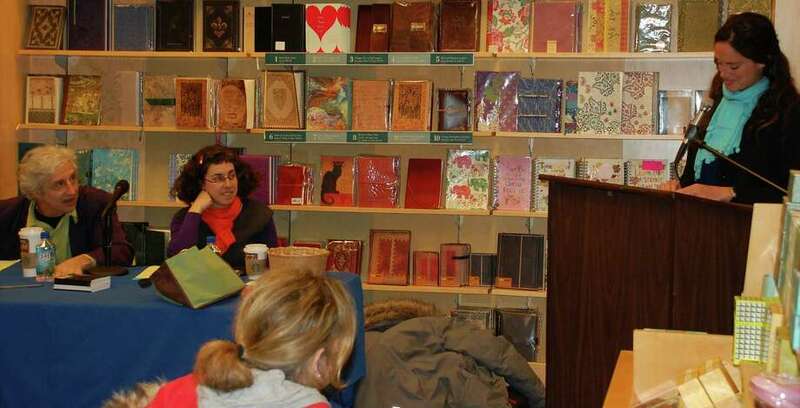 The Barnes & Noble book store hosted "Pitchapalooza" on Feb. 13 to give unpublished writers a chance to test their pitches on the husband-and-wife team, who in addition to being authors themselves are also literary agents and consultants. The event was a fundraiser for the Fairfield Public Library, which hosts monthly events and groups for writers. By buying a copy of the couple's book "The Essential Guide to Getting Your Book Published," participants were allowed one minute to make a pitch, as well as 20 minutes of consulting time at a future date. The writer with the best pitch received an introduction to an agent the couple feels might show interest in his or her work. Denise Lovett of Westport won that chance with an intriguing description of her novel, "The Inheritance," which tells the story of a woman of mixed racial background who discovers her father was really her mother's attacker. "I think it's a fantastic pitch," Sterry said. "There are so many great things going on." "I'm absolutely thrilled," said Lovett, who has published two other books under the name Denise Neuhaus. "I almost didn't come." Like many others, however, Lovett found the experience helpful. "It's the first time I've had the opportunity to pitch a novel," she said, "and they're feedback was really useful." Sterry and Eckstut offered many general suggestions and insights into what motivates agents and publishers to choose books. "Don't say what your book isn't," said Eckstut. "Say what it is." "Your pitch is your audition to show us what a beautiful writer you are," Sterry said. "I actually saw these guys in Darien," said Tricia Tierney, community relations manager for Barnes & Noble, "and I thought of all the writers around here." About 40 people attended the event, though only about 20 made pitches for their work. While the subjects of the books varied, most people were in agreement that the experience touched their nerves. "I felt very nervous, like I was exposing myself, but I have a great story and a great message to get out to women," said Suzanne Krauss of Westport, who pitched a memoir about her mother -- a Las Vegas showgirl -- called "And We Laughed." "I was nervous because I've never really spoken in front of anyone," said Donna Katz of Weston, who pitched a nonfiction book about coping with divorce. "It was a little nerve-wracking, to be honest," she said, "so I may have been rambling." Writers pitched novels, nonfiction and memoirs, with subjects ranging from ghosts, oceanography and yoga, to personal histories, tribulations and triumphs. Margaret Rumford of Fairfield, however, may have provoked the biggest laughs of the night. The New Zealand native pitched a story about an 11-year-old girl who naively observes the homosexual escapades going on her house, asking the question "Why is Jean-Paul stroking Uncle Everett's bum? Is he a pickpocket?" "I learned so much about how to pitch a book," Rumford said. "And also, to have contact with this couple (is) very worthwhile." "We were very excited to co-sponsor it with Barnes & Noble," said Jan Fisher, assistant director of the Fairfield Public Library. "We do have a number of writers' groups at the library." The library hosts the Writers' Room once a month, which features a guest host and discussion. There are also a range of writing groups that meet throughout the month on a regular basis.